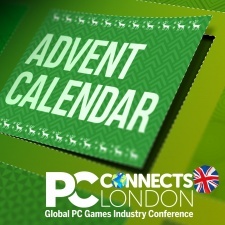 Welcome to the PC Connects London advent calendar! In the time-honoured tradition of the finest advent calendars, each entry will be a bite-sized treat ahead of the big day itself. Check back daily to find out more about a different part of Steel Media's new and exciting conference all about the business of PC games. Get a 10 per cent discount on your tickets - use code ADVENT18 and book now! 16 Conference Tracks - or is it 25? Mid-Term ticket prices end today! Christmas special offer - 20% off! The headline event, Pocket Gamer Connects London, will attract over 2,500 delegates from all around the world - including Europe, Asia and America - on 21st and 22nd January 2019. As well as the show floor, pitches, workshops and networking, the conference schedule features 16 tracks of seminars from 300 of the industry’s finest, covering mobile games, handheld consoles, and VR and AR. But that isn’t the end of the story - there are not just one, but two more shows running at the same time as Pocket Gamer Connects London. Your ticket will get you into all three shows and all 25 conference tracks. 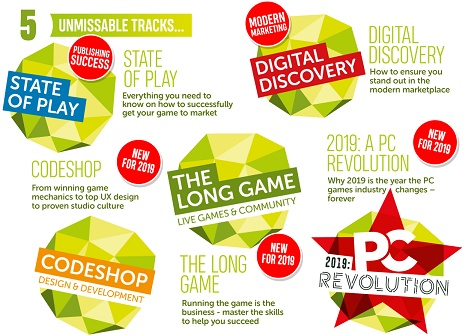 Making a welcome return for 2019, PC Connects London brings a further five seminar tracks entirely dedicated to PC games development. As well as its own Big Indie Pitch, the show focuses on the PC revolution in 2019 that will change the sector forever. Blockchain Gamer Connects made a triumphant debut in San Francisco last year. After a record-breaking follow-up in Finland, the show lands on British soil for the first time in 2019. Featuring a further four conference tracks, Blockchain Gamer Connects also gives developers and entrepreneurs the chance to pitch for investment in a live show. Europe’s biggest B2B expo and conference for the mobile games industry returns to the UK to kickstart a year of international events with Pocket Gamer Connects London on 21st to 22nd January 2019. With a total of 25 conference tracks across three industry events - Pocket Gamer, Blockchain Gamer and PC Connects, the event will host 2,500 attendees across the two days. There will also be vibrant expo space with a dedicated Indie Showcase; Big Indie Pitches; workshops; investor matchmaking; a mentor cafe; and networking, as well as the notorious Global Connects party. Get a 10% discount on your tickets - use code ADVENT18 and book now! Tickets for PC Connects London cost hundreds of dollars, but here are four ways to get in free - and you can’t argue with a price like that! The Big Indie Pitch competitions have become an institution in their own right, as independent developers pitch their projects to a panel of expert industry judges. Whether you think you can scoop the big prize worth thousands of dollars or just want some professional insight from the expert judges, find out more here. Not ready to join the fray of the Indie Pitch? Fear not, for ye may still enter the show floor armed with your latest build with which to bedazzle all and sundry. In other words, we’re giving away space on the expo floor to a select few indie devs - complete with free entry to the show. Applications close December 14th. Enter now! Want to cover the event for breaking news, feature research and in-person interviews? We’d love for you to come! All we ask is that you let your audience know in advance that you’ll be there. And if you share this registration link and encourage them to come along and meet you in person, we might even get you access to the exclusive VIP area. Apply for accreditation here. Putting on PG Connects takes a small army of people behind the scenes and in exchange for their time and effort, every one of them gets a free pass to the world’s leading mobile games industry event. Whether you’re studying event management in college, just started making the tea for a startup studio or just want to meet the people behind your favourite game, signing up as a volunteer grants you access to the hallowed hallways of Pocket Gamer Connects. You can apply here. If none of the free ways to get in work for you but you still want to attend, you can get a 10% discount on your tickets - use code ADVENT18 and book now! 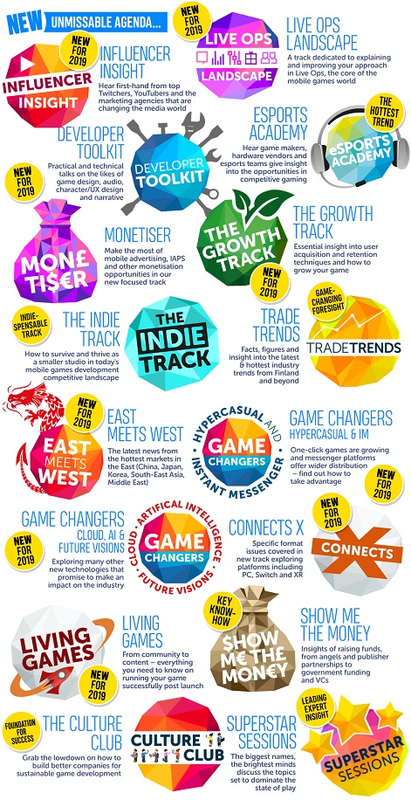 On the two days of 21st and 22nd January, 2,500 games industry professionals from more than 50 countries will gather in London for Europe’s biggest B2B event for the mobile games industry, Pocket Gamer Connects London. Pocket Gamer Connects London - of which PC Connects is part - is the first big European event of the year. Why wait with everyone else for GDC in March to start your networking in 2019? Get a two-month headstart by making your first meeting in London with a follow-up in San Francisco. No other event puts you in touch with the entire mobile gaming industry, from student developers to C-level executives. 57% of attendees are game developers (from indie to leading studios), particularly programmers, designers, and artist talent the most represented. Senior management roles account for 40% of our attendants, ensuring you're talking to the people who can make things happen. Pocket Gamer Connects London is all about helping you make the connections that are crucial for your business. Our online Pitch & Match meeting scheduler is free to all delegates, plus there are networking and matchmaking events such as the SpeedMatch sessions that pair developers with publishers and investors in a series of speed-dating style meetings for unrivaled opportunities. And we couldn’t leave without mentioning the tempting prospect of a free bar, finger food, music and dancing at the Global Connects party until late on Monday night, with more opportunities to network in a relaxed atmosphere. 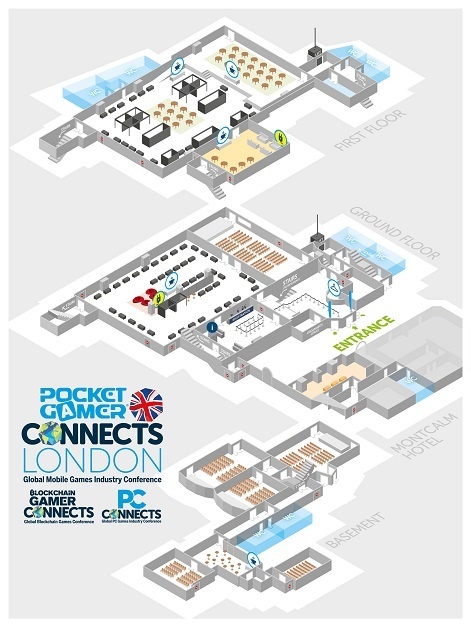 2,500 games industry professionals will attend PC Connects London 2019 parent event Pocket Gamer Connects London 2019 - that’s a lot of people to network with! Rather than leave things to chance and seeing who you bump into on the day - or spending hours trawling the internet for contact details to set up a meeting in advance - why not make use of our free and unlimited online meeting scheduler? To help you make contact with your dream prospects at the show, our Pitch & Match meeting scheduler is free to every single delegate, speaker, exhibitor and anyone taking part in pitches or jams. If they’re at the event, then you can arrange a meeting with them at a time and location of your choosing. You’ll receive an invitation to join by email as the show dates approach. It’s completely optional and totally free, no matter how much you use it - all you need to do is get stuck in! Since it was first held in 2014, Pocket Gamer Connects London has established a reputation for presenting the very finest speakers, industry leaders and big brands from the mobile games industry. And 2019 is no different. 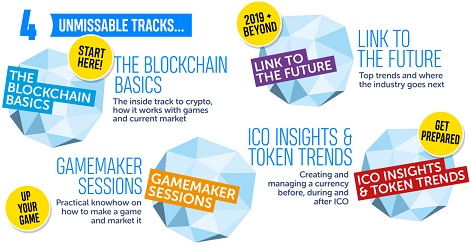 Well, apart from the fact it’s bigger than ever, with a whopping 25 conference tracks across three events - Pocket Gamer is joined by both PC and Blockchain Gamer Connects London for the first time. And PC has some big, big names with more yet to come! You can find out more about some of the amazing speakers here, here, here - and even here. Steel Media's new B2B PC event debuted in Helsinki in 2017, before the inaugural London conference at the start of 2018. PC Connects is part of Europe’s biggest B2B expo and conference for the mobile games industry, which returns to the UK to kickstart a year of international events with Pocket Gamer Connects London on 21st to 22nd January 2019. The best people any business can seek advice from is a proven success that has been there, done that - and want to pass on their hard-won learnings. CGX will bring its international series of Mentor Lounges to our show, where speakers and experts will be giving one-on-one advice in all areas of game development across leadership, tech, creative and industry initiatives. The Mentor Lounge gives you the chance to get one-on-one time with just that calibre of industry veteran and ask the burning questions that keep you awake at night. If you want to learn from industry experts on anything from coding to art to studio management or are seeking advice on the next step in your career - sign up now! We’re also looking for the very best mentors if you want to give back and share your expertise and advice in one on one mentoring sessions to help us change lives and build a more positive and knowledgeable industry. Apply here. The Pocket Gamer Connects London Mentor Lounge will be held on 21st January 21 at 10AM. PLEASE NOTE: This is available to registered attendees of Connects London 2019 only. Spaces are limited and allocated on a first-come, first-served basis so don’t hang about - apply now! 7 16 Conference Tracks - or is it 25? When Pocket Gamer Connects London returns on 21st to 22nd January 2019, it will be packing no fewer than 16 conference tracks! Not enough for you? There’s another five tracks to check out in PC Connects AND a further four in Blockchain Gamer Connects. Your ticket gets you into all three shows. The Brewery is the premier event venue in the City of London and hosted PG Connects in 2016, garnering the most praise from delegates of any of our Connects venues to date. So we’ve been back ever since. Conveniently located and easily reachable, The Brewery’s unique and flexible three-level environment lends itself effortlessly as the location to host PG Connects alongside partner events, PC Connects and BG Connects, while ensuring each Connects experience remains distinct and fully functional for its delegates. If you’ve not had time to talk to everyone you wanted on the first day - and with 2,500 delegates from 50 countries, that’s not unlikely - you’ll be pleased to hear that day one’s networking doesn’t need to end with the show. We welcome the specialist and mainstream media to our shows, giving you the chance to raise awareness for your project outside of the four walls of the venue. The editorial teams from all of our websites will be on hand, with the opportunity to get professional feedback in person on your work in progress from our games journos at the Journalist Bar. These brief consultations give you access to expert industry knowledge that would cost hundreds of dollars on the open market. There’s no need to book - just drop by the Journalist bar with your demo ready to go! Whether you’re a developer looking for help releasing your game, or a publisher seeking up-and-coming talent, the SpeedMatch sessions pair shortlisted applicants to make first contact during a dedicated two-hour stint of speed-date style meetings. These short meets obviously aren’t designed for closing a deal, but set the stage for a longer follow-up meeting during or after the conference. The SpeedMatch session is open to all qualifying attendees of Connects London. There’s no additional charge, but there is a filtering process. If you’re interested in taking part simply fill in the application form when we contact you nearer the show. Part of Pocket Gamer Connects, Europe’s biggest B2B expo and conference for the mobile games industry, PC Connects returns to the UK to kickstart a year of international events on 21st to 22nd January 2019 having debuted in the UK capital the year prior. With a total of 25 conference tracks across three industry events - PC Connects, Pocket Gamer and Blockchain Gamer , the event will host 2,500 attendees across the two days. We have some amazing speakers lined up to appear at Pocket Gamer Connects London 2019. You can find out more about some of the expert speakers here, here, here - and even here. 13 Mid-Term ticket prices end today! Want to come to Pocket Gamer Connects London on 21st and 22nd January but don’t want to pay full price? We understand that. In which case, the good news is that our Mid-Term ticket prices could save you up to $200. The bad news is that Mid-Term ends at midnight! Save up to $200 and book now! Pocket Gamer Connects London and its 16-track conference schedule may be the main ring at our circus, but for 2019 it’s joined by two other events for the games industry - and your ticket will get you into all three shows and all 25 conference tracks. Joining Pocket Gamer Connects on the 21st and 22nd January, PC Connects London makes a welcome return with a further five seminar tracks entirely dedicated to PC games development. Need somewhere to stay during your visit to Pocket Gamer Connects London on the 21st and 22nd January? You can book your hotel online with HotelMap’s deals for Connects London 2019, or call them on +44 (0)20 7292 2320 quoting reference code MVW7C. Or for that personal touch, if you would like assistance with your hotel booking you can contact Jessica, our dedicated hotel expert. Simply email [email protected] with your requirements, phone number and Special Reference Code MVW7C and she will get back to you to discuss your hotel options. Pocket Gamer Connects London sees the very first of our series of international Big Indie Pitch competitions for 2019. What better way to find out what the world’s indie devs are working on in their secret bunkers than to see them go head-to-head in competition? With dedicated pitches for both mobile and PC, entrants will try to impress a panel of expert judges for their share of a prize pool worth thousands. It’s a rare opportunity for participants to learn from an expert panel of judges as they vote for the most original, entertaining and polished games. All entrants get a free ticket! Whether you’re looking for your next job or to expand your team, you’ll want to stop by the Career Wall. Making its first appearance on UK soil, the Career Wall is exactly as it sounds; it’s a wall within the venue where companies can place situation vacant ads. It’s a simple idea that has proven immensely popular at our overseas events, connecting companies looking for new hires with the talent attending the show. And now we’re bringing it to London! We’re expecting more than 850 companies to be at our 2019 London outing in the new year. That’s a lot of networking! Investor Connector is a brand new show feature for 2019 that pairs games companies - or individuals - with an investor looking to spend the right kind of money in the right sector. Let us know how much funding you’re looking for using this form, as well as a little about your company vision, who’s on the team, what the business model is and what you would use the money for. If you make it through the approval process, we’ll line you up a one-to-one slot with an investor that’s hot to trot. After that, it’s all up to you! Investor Connector is only open to registered attendees of Connects London 2019. Pocket Gamer Connects London and its 16-track conference schedule may be the main ring at our circus, but for 2019 it’s joined by two other events for the games industry. Joining Pocket Gamer Connects on the 21st and 22nd January, Blockchain Gamer Connects brings another four conference tracks. Christmas may be nigh, but we’re heading into the winter break full speed ahead thanks to our very own Donner and Blitzen and a whole team of conference elves still in the workshop hammering into shape the largest agenda we've yet put together. Since launching Pocket Gamer Connects in 2014, every year we carefully curate the very finest speakers to appear as part of our conference schedule. Come the 21st and 22nd January though, we’ve surprised even ourselves with the amazing talent taking to the stage with a whopping 25 conference tracks across three events. We’ve already shared some of the names on our Nice List, such as Supercell, King, Rovio, CD Projekt Red, Ubisoft, Facebook and many more. You can find out more about their seminars in our previews one, two, three and four. If you work in the mobile games industry, then you won’t want to miss the Mobile Games Awards 2019 gala ceremony at BAFTA on the last night of Pocket Gamer Connects London, 22nd January. Celebrating a fantastic year for the sector, it’s a glamorous affair, even if we do say so ourselves. You can reserve your place by registering here. 24 Christmas special offer - 20% off! It’s 24th December, so that means it’s Christmas Eve - and the last day of our Pocket Gamer Connects London advent calendar! We’re sure you’ve all been good boys and girls this year, so here’s a present from us in this season of goodwill. How does a special festive offer of up to 20% discount sound? Simply use code SPIRIT and book your tickets before midnight, 1st January 2019. Get a 20% discount on your tickets - use code SPIRIT and book now!